Olives are oval-shaped fruits obtained from the Olea europaea tree; a naturalized, medium-size tree of Mediterranean origin. The fresh fruit and oil extracted from them have been part of staple food sources for the natives around the Mediterranean Sea for centuries. Ancient Greeks believed that growing olives would bring peace and prosperity since the entire population relies upon it to secure most of the life's essentialities. Botanically, the fruits belong to the family of Oleaceae, in the genus: Olea. Photo courtesy: A.Poulos Olives (Olea europaea). Olive is a slow growing, evergreen tree with gnarled trunk dividing into gray, fissured branches and foliage of gray-green, fleshy, narrow leaves. It may reach up to 50 feet in height in their natural habitat and may last for more than 500 years. It grows well under frost free, dry, and well-drained soils. It starts bearing fruits when the plant reaches about 3-4 years of age; however, some cultivars may take much longer time before their first harvest. The tree blooms in the spring which subsequently develops into a small round to oval green color berries by summer. Olive is a drupe or "stone fruit" with a central single seed (pit), surrounded by edible pulp. Their size and shape greatly vary depending on the cultivar type. On an average, a fruit weighs about 3-5 g. Raw fruits are green and turn yellow to dark as they ripen further. Olives are generally picked at different stages depending upon whether they destined to be used as table fruits or pressed into oil. Traditionally, olives have been viewed as a very healthy food. Besides providing energy, they compose of significant amounts of plant-derived antioxidants, minerals, phytosterols, and vitamins. Olives are a modest source of calories; 100 g of fruits carry just 115 calories. Their calorie content primarily comes from fats. Nonetheless, the fruit composes healthy fat in the form of monounsaturated fatty acids (MUFA) like oleic acid (18:1) and palmitoleic acid (16:1) that help lower LDL or "bad cholesterol" and increase HDL or "good cholesterol" in the blood. Research studies suggest that the Mediterranean diet which is rich in monounsaturated fatty acids help to prevent coronary artery disease and strokes by favoring healthy blood lipid profile. Olive fruit contains tyrosol phenolic compounds such as oleuropein and oleocanthal. These compounds are responsible for its bitter and pungent taste. Oleocanthal, oleuropein, and its derivative hydroxytyrosol are nature’s most powerful antioxidants. Together with vitamin-E and carotenoids, they play a vital role fighting against cancer, inflammation, coronary artery disease, degenerative nerve diseases, and diabetes. Studies suggest that oleocanthal has ibuprofen (NSAID) like anti-inflammatory activities. The Mediterranean diet that uses olive and its oil may be responsible in part for the lower incidences of coronary artery disease. Olive contains a good amount of vitamin-E. 100 g of cured, and canned fruits provide 1.65 mg (11% of RDA) of α-tocopherol. Vitamin-E is a powerful lipid soluble antioxidant, required for maintaining the integrity of cell membrane of mucosa and skin by protecting it from harmful oxygen-free radicals. Also, they contain healthy amounts of minerals like calcium, copper, iron, manganese, and zinc. Further, they are small sources of B-complex vitamins such as niacin, choline, and pantothenic acid. Olives nutrition (Olea europaea), ripe, canned, (small to extra large), values per 100 g. (Source: USDA National Nutrient data base). Raw Olives cannot be eaten as they are because of the bitter principle oleuropein. Some enthusiast olive-fans may want to cure them on their own. If you are placed at close quarters to any olive farms that sell raw fruits, try to buy fresh olives for home-curing. Otherwise, almost all the types of olives in the markets already treated and cured. Different techniques of curing and processing employed for fresh green or ripe fruits. Once at home, packed/canned olives may be placed in the dark cool place until the “use by” date from the manufacturer. However, once opened, the fruits should be kept in the refrigerator, preferably transferred onto a glass or plastic bowl and immersed in the brine. Use them within 1-2 months of purchase. Cured olives have been an integral part of the Mediterranean diet since ancient times, especially in the Greece, Spain and Italian households. Cured and ready to eat olives are available in the stores and all that you need to do once you open the jar is to give them a wash in clean water to bring down their sodium content. 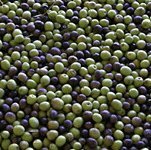 Some people prefer to cure olives at home employing traditional methods and avoid commercial "lye-cured" (sodium hydroxide) ones for many reasons. Both cured black and green olives are equally popular as finger food in Europe. They also one of the sought after ingredients in recipes all over the world. Some of the well-known black (ripe) types include Manzanillo from Spain and Kalamata from Greece; and among the green types are Hojiblanca (Spain), and Lucques (France). 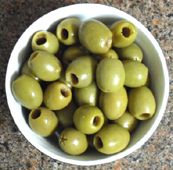 Traditionally, olives are eaten as a side dish or snack. They chiefly served as appetizers or starters. Pitted and sliced olives add great flavor to salads, in pasta, and as pizza toppings. They also give a special salty flavor to dips, sauces, tapenade, etc. Olives are safe food to eat; however, some individuals might manifest some allergic symptoms to lye-brine (caustic soda). Additionally, lye or salt cured olives contain a high concentration of sodium than recommended intake. Shift the fruits into a bowl and wash in clean water few times until all the lye/salt content removed. (Medical disclaimer). olive oil nutrition facts and health beneifts. <<-Back to Fruits from Olives nutrition. Visit here for an impressive list of all variety of fruits with complete illustrations of their nutrition facts and health benefits. USDA National Nutrient Database. (opens new window). International Olive Council-International Olive council.